Size: 1" Thickness #4102" Thickness #420 Color: Black Only All Sizes This item is currently out of stock! 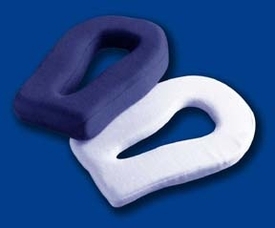 This Face pillow adds an extra cushion of comfort to the patient's eyes and face while on any treatment table. The 1” Face Cushion is a great addition to treatment tables that have an existing hole cut into the top of the treatment table. This Face Cushion adds the extra foam padding needed to relieve stress and discomfort to the patient's eyes and check bones. The 2” Face Cushion is ideal for massage tables, beds or other flat surfaces that are not equipped with a face cradle or hole cut out. The 2” thickness lifts the patient's face up just enough to create a comfortable space for the patient's nose while adding comfort to the eyes and face. Use our flat Face Sheet, made of 100% cotton flannel, for additional comfort for your patient while protecting the Face Cushion from body and massage oils. Constructed of 100% polyurethane foam (individually hand-sewn cover) made from a cotton/poly jersey fabric, this Face Cushion is machine washable.